When my husband and I decided to apply to med schools together, we knew the road ahead would be challenging. Here’s what we did. Getting accepted into medical school on your own is a challenging endeavor, but getting two people into the same school at the same time can seem almost impossible. 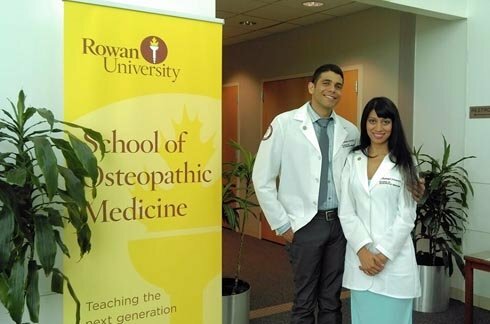 My husband, Trajan, and I were the only couple who got accepted together among the more than 160 students in our class at the Rowan University School of Osteopathic Medicine (RowanSOM) in Stratford, New Jersey. Trajan and I met at a community college in California. I was a nursing major who emigrated from the former Burma, and he was a radio broadcasting major just out of the Marine Corps. After many long meaningful talks, we realized we wanted to spend our lives together. Around the same time, we both decided to pursue medicine. As Trajan and I enter our second year, we would like to pass along the lessons we learned to other couples interested in applying to medical school together. You will be surprised how much you can find out by talking to students, faculty and clinicians. In our case, we spoke with our mentor, Tom Landefeld, PhD, a pre-health advisor at the California State University, Dominguez Hills. Dr. Landefeld has visited many medical schools and shared his insights with us on which schools were particularly family-oriented. Find a mentor who knows you both. Then when it comes time to write recommendation letters, your mentor can discuss how great you and your partner work not only individually but also as a team. Although a personal statement should focus on your achievements and individuality, be sure to mention the strengths you and your partner both can bring to the school. Trajan and I noted in our personal statements the premed health care radio show we started at California State University, Dominguez Hills. During my medical school interviews, I mentioned that we would like to continue our radio work in medical school. Now we host episodes of Rowan University’s medically oriented radio talk show “Your Health Matters” where we interview physicians and researchers about current topics in health care. 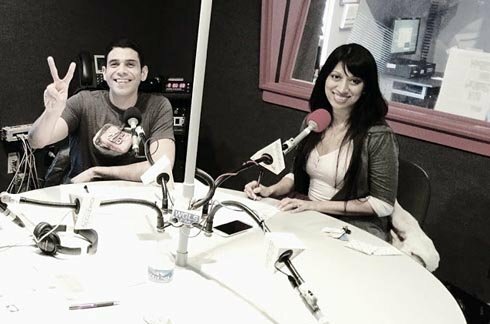 Barrera (left) and Patel discuss current topics in health care on a radio show at Rowan University's 89.7 WGLS-FM. We did not get into a U.S. medical school on our first try. Before trying again, we both got jobs at clinical research labs and I raised my MCAT score. On the second try, we received some interviews together as well as individually. If you really want to go to medical school together, you might not get it on your first try, but it’s worth trying again and again because the payoff can be huge. So far, attending RowanSOM together is looking to be the second-best decision I have made in my life after marrying my husband. I remember my palms sweating and my heart pounding during my interview at RowanSOM when the interviewed asked me: “What would you do if only you or your husband was accepted to RowanSOM?” Calmly I answered, “We will cross that bridge when the time comes.” Although I didn’t say it out loud, I believe the interviewer understood then that my husband and I came as a package deal.